This was the site of our restoration work for the day as well as a walking tour of the preserve. Thanks to those who attended the walk, as well as those who helped support it. Thanks also to the volunteers who cut and burned honeysuckle and burning bush within sight of the parking lot - not often we work that close to our meeting place. We'll be back there Saturday hosting a youth group from Bridgeview, ought to be a fun day. We were fortunate to find some spring wildflowers, including a number of bloodroots and a sprinkling of spring beauties in bloom. Bet they were not happy with the following day's surprise. You might have noticed our substantial snowfall, which normally brings me great joy. This one was ridiculous. Big wet flakes, blustery winds, and the certainty that all would vanish within a day, rendered this weather event totally useless. Fortunately it didn't seem to have an impact on our native flora which was back in view within a day of the snow melting. Due to another commitment your roving reporter couldn't make this one, but others who were present say this: it was another round of catalpa toss, hoisting logs much larger than you'd normally pick up (catalpa being a very lightweight wood) and tossing them on the fire like you're some macho superman or woman. Great fun, highly recommended in these pages. I did a round of it a month ago and also found the catalpa's quick burning property gratifying. Our return here allowed for further cleanup an area last worked under snow cover around Presidents Day. Like the preceding day, we returned to a site last worked in February to do additional cleanup and burning. This was a pretty area above the creek, a stone's throw from the western border of Black Partridge, which is also the border with Will County. We were blessed with a super group on a lovely sunny March day, including first-time Palos volunteer Ethan. We were also way beyond fortunate that Bob Erck showed up with his chainsaw. John's was balky and Bob's saw was truly a force multiplier on the task we engaged. Pat spotted a pileated woodpecker, came thisclose to getting a good picture. This was later in the afternoon, when the work ceased and we sat waiting for the fires to burn down. Beautiful day, beautiful place. We were back at Cap on consecutive Saturdays. Got a really good workout on this one, side by side with a terrific crew that built several roaring fires. Drier conditions and ample winds made fire-starting easy so we were able to focus on the dragging and burning side of the job. I went back two days later to walk portions of the preserve, starting from our work site then crossing Visitation Prairie and looping to the north before reconnecting with the Sag Trail near the area where Bob Arentz is clearing brush. We passed through a big section cleared by the recent brush-mowing project, crossing the prairie, and visualizing what it all will look like in a few weeks as the growing season gets underway. This was Mary Busch's birthday so Jeimar ("J") brought his violin to serenade her with a musical interlude. We found a safe place to locate a fire at the bottom of a slope (a very windy day, hooray for ground-truthing!) and continued to push into the wooded area, taking out honeysuckle and multi-flora rose along the way. Students from Stagg, Conrady, Whitney Young, and GCE Lab School graced our day with their presence and efforts, and Andrew got his first field experience herbiciding. Thanks to all of them, including first-time Palos volunteers Bryce and Francisco. Thanks to Nicole Pierson from FPCC Volunteer Resources for attending, to those who came early to set up and to those helping with cleanup at the end - as Julie noted on FB, all we had to do when we got home was wash some napkins, everything else was clean and only had to be put away. Special thanks also to Mike for the t-shirts he made for our group. Super job! We had quite the productive day despite having to shift gears at the start. With two chainsaws and two brushcutters running we had an abundance of cut brush to haul and burn. Relatively dry conditions and ample wind made it easy to get the fires going and keep 'em burning. ​Stewardship aides Teri Radke and Cyndi Duda started this class with an hour in the field near Maple Lake viewing a variety of native shrubs, then moved indoors to Little Red Schoolhouse, a good move on a cold breezy morning. There we viewed numerous twigs and buds, getting a wealth of good information and insight. Thanks Teri and Cyndi! In February we didn't burn at Cap so we had an abundance of cut brush awaiting us. By afternoon's end we had all of it on the fire and Patrick continued to cut and add more fresh stuff. This area, up high on a hill above the treail and wetland, continues to open up with each visit. It will lok sensational come growing season. 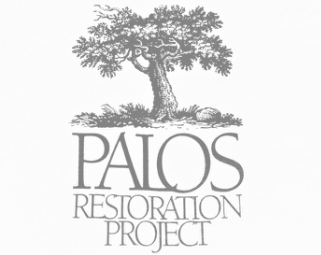 No restoration work in Palos on Saturday as many of us attended Wild Things in Rosemont. This was a good conference, the biggest challenge came in selection which speaker to see in each time slot. I guess I chose well as none of them disappointed. The breadth of topics was amazing and the day passed quickly. We canceled both our Sunday sessions due to wind speeds far too strong to safely work in a woodland. Not a bad choice either; yesterday I visited our would-be work site at Swallow Cliff Woods and found a newly fallen dead tree within spitting distance of one of our brush piles from our last visit. Several broken limbs from the white pines near the parking lot also lay on the ground close to where we walk in. So no regrets over the cancellation. Though we hate to lose the day (and we've lost several recently) there truly is a time to let prudence rule. Thanks for that, Jackie and Diana! While we work feverishly to remove buckthorn when we see it, the colors of its wood are undeniably striking. Amber Kunz, member of the FOTFP Palos crew and regular volunteer at Sundown Meadow, created the plaque seen below from a cut wedge of buckthorn. Check it out. Thanks to first-timer Marc and second-time Palos volunteer Chris for being part of this one, to Jim and Doug for their tireless energy and strength. We thinned trees not far from the trail and Ford Road, with several big, hot fires on a chilly morning. Cap Sauers looks beautiful these days, with large tracts opening up due to brush-mowing funded by an anonymous benefactor. We are ever so grateful for this generous spirit - in addition to making huge improvements to the landscape, it brings a strong gust of wind to volunteers' sails. My thanks to Kathy Bruch for providing photos and an account of this session. And it was a tough one, an icy, sleety cold afternoon that resisted Carrie's and Devin's best efforts to build a sustainable fire. Perhaps if they had some 'dream wood' handy... see my next entry for more on this wondrous stuff. This was our President's Day special and we spent it cutting and burning catalpa trees that have made their way into Willow on the north end. I am giving catalpa the tag 'dream wood' for two reasons. One; it's a lightweight, low-density wood enabling one to easily hoist a much larger log than would be possible with maple or other denser woods. It can trick you into thinking you're actually strong! Two, it burns like a dream. Despite three inches of new snow, we got our fires going with a few short minutes of propane to each stack, no need to follow up with a leaf-blower. Carolyn stopped gathering deadwood for kindling because it wasn't needed. Thanks to FOTFP Palos crew leader Xochitl, who came to help on her day off AND brought a friend, Aaron. Kevin and Joe also were on hand. We had a small group thinning trees at Willow West, again in sight of Fairmount Memorial Gardens. Sunshine took the edge off a cold early morning, and several large fires were an immense help too. Thanks to first-time Palos volunteers Andrew and his dad Mike. They're from a local Boy Scout troop and we hope to join forces with them again. We had a great group, with first-timers Chris, Maeve, Joe, Mike, and Trevor, as well as returning friends Andrew, John, Tyler, and Doug. John ran his chain saw while the rest of us hacked and burned, pushing farther north on the slope rising above the prairie. The snow started at 1 pm, a little ahead of schedule, as the last of the volunteers walked out. Someone on the radio said we had a string of over 30 days with some form of precipitation; this was one of those lighter snowfalls that do little more than make driving more interesting. A note of sadness - learned Monday that Tom McAvoy, former 3rd Ward Alderman in Hickory Hills, passed away last December. Tom was a long-time friend of Roger and Cara Keller, and a friend of Palos Restoration Project. For years Roger and Cara wrote a bulletin, "The Other Side of Kean", informing their neighbors of restoration activities at Hidden Pond. Alderman McAvoy included this in his 3rd Ward newsletter, distributed throughout the ward. I believe their last issue was June 2015, months before Roger's passing. Doug Chien and I met Alderman McAvoy about two years ago at Moraine Valley College, when he asked us to produce another edition of "The Other Side of Kean". Doug did so and the alderman's corps of volunteers again distributed it. We are grateful for the kindness and help extended to us by this gentleman.